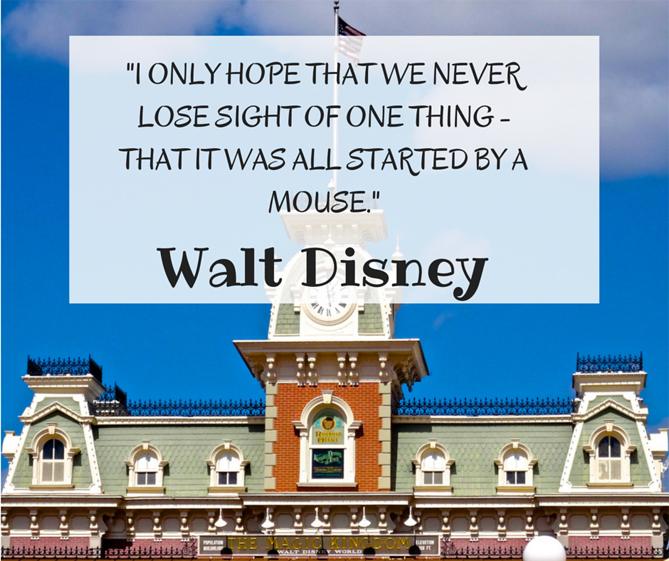 Magic Kingdom was the first Walt Disney World theme park. It opened October 1, 1971 and has been known as the “Happiest place on earth” ever since. It mimics Disneyland in Anaheim, California however there are many differences. If you have the opportunity to visit both parks the most obvious thing you notice walking down Main Street USA is that at Disneyland you cannot see the castle until you are much closer. That is because the castle is much smaller at Disneyland than Disney World. If you were visiting for the day, you will park in the Magic Kingdom parking lot and then take a tram to the Transportation and Ticket Center. From there you may either take a boat or the monorail across the lake to Magic Kingdom. There are two monorails. One that travels directly back and forth to the Magic Kingdom and the other monorail stops at the hotels along the route. The ferry boat just runs back-and-forth to and from the park. Once you are at the actual park entrance, those people carrying bags, backpacks, and purses have to go through the security checkpoint. After you pass through security you then get to the actual entrance gates where you now can use your Magic band for entry or a ticket. Upon going through the gates, the first thing you see is the Walt Disney World Railroad high above on the platform which will take you around the entire park. It has stops in Frontierland, Fantasyland and back at Main Street USA. There’re six official areas at Magic Kingdom. These are Main Street, USA, adventureland, Frontierland, Liberty Square, Fantasyland, and Tomorrowland. It is highly recommended that you pick up a map at the front of the park. You will find maps in multiple languages (so make sure you pick up the right one) as you pass through the tunnels that go under the Walt Disney World railroad. In Adventureland you find the Swiss family tree house, the Magic carpet ride, Enchanted Tiki room where the birds sing for you, The jungle cruise and Pirates of the Caribbean. Next door to Adventureland is Frontierland. There you will find Splash Mountain, Tom Sawyer Island which is a great exploration experience for younger children, Big thunder Mountain Railroad and Country bear jamboree. Moving on clockwise, next you come to Liberty Square. There you will find the River boat, Hall of presidents and of course the Haunted mansion. The Haunted mansion has recently added some interesting things in the wait line for you to do and see. Adjacent to the haunted mansion is fantasyland. Fantasyland is always one of the most crowded areas as there is so much to see and do there. There are so many there we will just mention a few of the rides. One that usually has a shorter wait time bit is still a fan favorite is it’s a Small World. One ride that typically has a long wait time is Peter Pan’s Flight. Of course the Carousel is in the center of Fantasyland and it usually does not have too long of a wait line. And we can’t forget the Many Adventures of Winnie the Pooh or the Mad Tea Party. Of course Dumbo the flying elephant is still a favorite and the newer rides of the Seven Dwarfs Mine Train and Under the Sea journey of the Little mermaid shouldn’t be missed. And last but not least is of course Tomorrowland. There you will find kids favorites with the Tomorrowland Speedway where they can drive their own car, the Astral Orbiter which zooms around high up in the air, Buzz Lightyear where you can shoot the aliens, the Carousel of Progress and the Tomorrowland Transit Authority previously known as the People mover. They also have Monsters Inc. Laugh Floor and Stitches Great Escape and of course thrill seekers cannot miss Space Mountain. At Disney World you have two choices which are to either rent inside the themepark or from an outside Orlando scooter rental company. If you choose to rent from Disney World you must rent the scooter from inside each of the individual theme parks. Since they’re provided on a first-come first-served basis and you may not reserve them in advance, it is a good idea to consider reserving your own Orlando scooter rental. If you do plan on renting inside the theme park you want to get there very early as they do tend to sell out quickly. If you’re planning on park hopping, which means going from park to park in one day, and you rented it from inside the park, you will need to return your scooter at the park you rented from and pick up another scooter at the next Park you go to. You must keep your receipt to do so however you are not guaranteed to get one. It is only if they have one available. And once again you cannot reserve scooters from inside the theme park in advance. 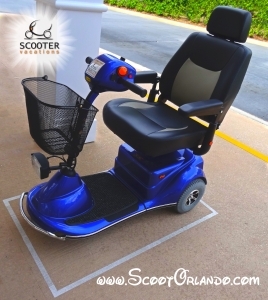 All Orlando scooter rentals can be used at the theme parks. You are not limited to just renting one from the actual theme park. To rent a scooter, mobility scooter, electric wheelchair, electronic convenience vehicle, ECV, for any Disney World theme park, all you need to do is make a reservation either online or by telephone and it will be delivered to your hotel, resort, timeshare, villa direct or even campground. Scooter Vacations is the only company that offers six different scooter models to choose from and three will fit in a car trunk with a weight capacity of up to 450 Lbs and our luxury models handle up to 550 Lbs. If you are staying on property at one of Disney World’s resorts your scooter transportation will either be via bus boat or monorail unless you brought your own car and then you may want to consider a portable model so you can use your car or the Disney transportation. Depending on which resort you’re staying at will determine the types of transportation available to you. Each Disney bus takes 2 to 3 scooters at a time. The bus driver simply Rolls out a ramp and you ride right onto the bus. The monorail is also similar where they have the middle carriages reserved for scooter riders and the attendance Will place down a ramp for you to ride on and off the monorail. Scooter vacations scooter rentals provides 12-15 hours of daily theme park use battery power. In addition, Scooter Vacations is the number one luxury mobility scooter rental company serving Walt Disney World and all venues in Orlando. Ensure you have the best for your Walt Disney World vacation. Delivered directly to your hotel, timeshare, resort, or private residence within a 10 mile radius of the theme park area. Telephone reservation assistance from 7 am to 8 pm, 365 days a year. 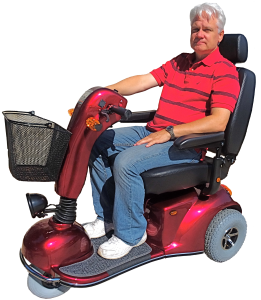 Mobility: SV’s electric wheelchairs (ECVs) are self-propelled so you won’t need to rely on others to assist you. Weight restrictions:Wheelchairs at Disney’s Magic Kingdom have weight restrictions (about 350 pounds). Our electric scooters can facilitate more weight and the batteries last all day at Magic Kingdom. Availability: Disney Magic Kingdom wheelchairs have limited availability and on busy days, they sell out. Book an electric scooter for Magic Kingdom with Scooter Vacations and we guarantee availability. Park Hopping: If you plan on leaving the Magic Kingdom to visit another park in the same day, you’ll need to return your wheelchair and rent a new wheelchair at each park you visit. Rent from Scooter Vacations and your scooter stays with you all day no matter where you go! Scooter Vacations offers rental mobility scooters for use in The Magic Kingdom and throughout Orlando theme parks.